Here's some chamber music by two Canadians. Most remember Glenn Gould (1932-1982) as the legendary pianist who popularized the keyboard works of J.S. Bach through the medium of the LP, but he also dabbled in composition. Not as well known as Glenn, at least outside of Canada, Sir Ernest MacMillan (1893-1973) was born in Ontario, educated in Great Britain as well as Toronto, and went on to become one of his country's most influential conductors and composers. Gould was a great admirer of Schoenberg (1874-1951), so it's not surprising to find those late romantic works written by the latter before he fell off the tonal wagon seem to be an influencing factor in Glenn’s string quartet (1953-1955). It's in a single sonata form movement of Mahlerian proportions, lasting just over half an hour. The opening statement starts with cryptic, fragmented tone rows that bring to mind Beethoven's late quartet efforts, more specifically the beginning of the fifteenth (Op. 132, see the newsletter of February 2007) and the Grosse Fuge (Op. 133). These are the stem cells from which the dermis of Gould’s quartet will grow, and they're followed by a second, more sustained theme [track-1, beginning at 04:44], recalling Schoenberg's Verklãrte Nacht (1899). He skillfully develops these ideas using a number of highly complex contrapuntal devices, which he no doubt learned from all those keyboard works of Bach that were his specialty. The recapitulation takes the form of a massive coda where all the motifs reappear in a variety of colorful guises. These include spooky, tremulous sul ponticello trappings that end the work in haunted fashion. Some may criticize this piece for its youthful naiveté, but there's a sincerity and sense of purpose that make it most appealing. MacMillan was visiting Paris in 1914 when he decided to attend the Bayreuth Festival in Germany. Bad idea! Because shortly thereafter World War I broke out, and he was interned in a German detention camp along with British composers Edgar Bainton (1880-1956, see the newsletter of 15 May 2008) and Benjamin Dale (1885-1943, see the newsletter of 30 May 2008) until the end of the war. During his imprisonment he started his one and only string quartet, which he completed and revised in 1921 after his return to Toronto. In the usual four movements, it's a masterfully constructed work that has all the rigor of Frank Bridge's quartets as well as impressionistic touches reminiscent of Ravel and Debussy. It opens with a youthfully energetic allegro followed by a Mendelssohnian scherzo, and a lovely Elgarian lento. In the striking finale angelic and diabolic forces battle one another, with the former eventually prevailing. The disc concludes with MacMillan's Two Sketches for String Quartet Based on French Canadian Airs (1927). The first is a reserved, gorgeous Gregorian setting of the hymnlike "Notre Seigneur en pauvre," and the second, an infectiously spirited caper derived from a bouncy little ditty known as "À Saint-Malo beau port de mer." Later orchestrated, these pieces would become one of the composer’s most popular works. Based in Québec, where it was founded in 1989, the Alcan Quartet is fast becoming one of Canada's most promising chamber groups. The sensitivity with which they play the Gould, and their enthusiastic, committed performances of the MacMillan pieces make a strong case for these selections. Hopefully they'll treat us to more little known quartets in the not too distant future. The recorded sound is superb with the quartet perfectly arrayed across an ideal soundstage in an affable acoustic. The string tone is natural and for the most silky with only an occasional hint of brightness. This release is definitely in the audiophile category. Not too long ago (see the newsletter of 15 April 2009) we told you about the music of German composer Salomon Jadassohn (1831-1902), which is now undergoing a revival. These two recent releases from Cameo Classics give us more of it as well as some by another equally underappreciated Austrian composer, Ignaz Brüll (1846-1907). Hearing them, one can only wonder why they’ve languished in obscurity for so long. The answer seems to be they were of Jewish descent, living at a time when anti-Semitism was on the rise in their native countries. A good example of this would be statements by the likes of Richard Wagner (1813-1883) to the effect that Jews were harmful and alien to German culture. All this peaked in the 1930s and 40s when the Nazi came to power, and banned Jewish music as Entartete (Degenerate). The disc pictured above and to the left has the first of Jadassohn’s four symphonies and the earlier of his two piano concertos. As a makeweight Russian romantic composer Pavel (Paul) Pabst's (1854-1897) one and only piano concerto is also included. Jadassohn taught at the Leipzig Conservatory and was considered one of their best professors of music theory and composition. In fact his students included Felix Weingartner (1863-1942, see the newsletter of 8 September 2008), Frederick Delius (1862-1934) and Richard Franck (1822-1890, see the newsletter of 15 April 2009). Consequently it's not surprising to find his first symphony (1861) masterfully constructed. In the standard four movements [tracks-1 through 4], it begins with an optimistically assertive allegro. The influence of Felix Mendelssohn (1809-1847) is evident as well as in the cheeky scherzo that's next. While the comely largo and spirited concluding allegro have thematic as well as rhythmic affinities with the music of Robert Schumann (1810-1856). It certainly whets one's appetite for the remaining three Jadassohn symphonies. Turning to his first piano concerto (1887), we have here a recording of a life performance done in 2008 [track-8], which was the first time this stunning work had been played in public since the composer's death! Consequently there's some extraneous audience noise, and those put off by it are referred to the studio recording recommended in the newsletter of 15 April 2009. But the playing here is a labor of love, and most listeners will probably want both versions. The Pabst concerto from 1882 filling out the disc [tracks-5 through 7] appeared on a Danacord CD back in 2008 (see the newsletter of 24 July 2008). And comparing it to the one here, both soloists are excellent, but the orchestra in the Cameo version is not as good. Also, the Danacord is a studio recording while the Cameo comes from a live performance. Consequently the sound is much better on the earlier release. 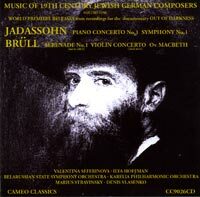 The other disc pictured above and to the right is devoted entirely to Brüll. It includes his only symphony, plus a complete version of the first of his three serenades for orchestra, whereas Cameo only gave us two movements from it on a previous release. As his good friend Johannes Brahms (1833-1897) acknowledged on more than one occasion, he was an exceptional melodist, and it shows in these works. The four movement symphony (c. 1880) begins with an impressive moderato that takes on the characteristics of a solemn procession. A gentle breeze of an allegretto follows, and then a delicate scherzo that's as light as a feather. The finale is another moderato, but there's a greater sense of urgency as it rushes headlong to a hapless conclusion. Most would have to agree the six-movement serenade (c. 1875) ranks right up there with those of Brahms and Austrian Robert Fuchs (1847-1927, see the newsletter of 25 April 2012). While there are moments of Mendelssohn in addition to Brahms, it also points the way towards such later Austrian composers as Franz Schmidt (1874-1939, see the newsletter of 15 January 2010) and Joseph Marx (1882-1964, see the newsletter of 15 April 2009). The work is worth its weight in gold for the tuneful finale alone. And speaking of Brüll's gift for melody, if you don't already know them, you'll want to check out his two piano concertos. The Belarussian State Symphony Orchestra under Marius Stravinsky (no relation to Igor) performs everything here except for the Jadassohn concerto, which is courtesy of the Karelia State Philharmonic Orchestra under Denis Vlasenko. While concerto soloists Panagiotis Trochopoulos (Pabst) and Valentina Seferinova (Jadassohn) are magnificent, both orchestras seem somewhat shaky in spots. But as we've noted before, with repertoire this rare we're lucky to have what's here. These recordings won't win any audiophile prizes. However, they're surprisingly good considering the Pabst was taken from a live performance, and the others made in conjunction with a television documentary on German suppression of music by Jewish composers. Incidentally both discs are in stereo. Previously we told you about a couple of exceptional releases featuring chamber music by German composer Max Reger (1873-1916, see the newsletters of 15 and 30 March 2008). Now here's a third with two of his most outstanding contributions to that genre. The clarinet quintet (1915) included here was his last work, and ranks with those of Mozart and Brahms. In four movements, there's an auburn autumnal aura that emanates from the opening moderato, which must make it one of the most beautiful movements Max ever penned. Motifs introduced here will reappear throughout the entire work, giving it that cohesiveness so typical of his creations. There's something magical about the exceptionally delicate vivace that's next. One can easily imagine a Disneyesque enchanted garden with iridescent fairies fluttering about. The melancholy largo that follows builds to a passionate climax, and then fades away with Saturnian grace. Like the Mozart and Brahms clarinet quintets, Reger ends with a theme and variations where the main idea is derived from the thematic nexus at the very beginning of the piece. The sublime variations that follow bring this sumptuous offering to a pacifically blissful conclusion. You'll find a directness and simplicity here that often characterize composers' final efforts. As a consequence, Reger's usual chromatic peripateticism is at a minimum. The four-movement string sextet (1910) was apparently one of Max’s problem children, with only four bars of the initial first movement making it into the final work. Be that as it may, the opening allegro is a complex mind bender where Reger's deft use of rhythmic, harmonic and contrapuntal elements insure all six bows are gainfully employed. The lighter textured vivace that follows is scherzo-like, and relieves the tension previously generated. The composer referred to the largo as his "dialogue with the dear God." It's a very moving bit of string writing that contrasts sharply with the frenetic finale. Here, as in the first movement, all bows are busy bees at times generating string sounds approaching orchestral intensity. While Brahmsian principles underlie the work, there's a chromatic and contrapuntal flirtatiousness about this music that makes it uniquely Reger. One of Germany's finest chamber groups, the Villa Musica Ensemble (VME), gives us superb renditions of both works. Clarinetist Ulf Rodenhäuser delivers one of the finest performances of the quintet on record, and hearing it you'll also want to investigate VME's highly praised releases for MD&G of music by two other German composers who bracketed Reger, Joseph Joachim Raff (1822-1882) and Paul Hindemith (1895-1963). The recordings are demonstration quality with an ideally dimensioned soundstage, and warm acoustic perfectly suited to these rarely heard, exceptional chamber gems. The instruments are well balanced with a clarinet sound that would melt the iciest of hearts. The strings are for the most part silky, except in ff passages where there's just that little extra bite which adds all the more drama to these winsome selections. The illegitimate son of Richard Wagner (1813-1883) and Franz Liszt's (1811-1886) daughter Cosima (1837-1930), Siegfried Wagner 1869-1930), whose birth inspired the ever popular Idyll, was a significant opera composer in his own right. Of the eighteen stage works he started, Der Schmied von Marienburg (1920), or The Blacksmith of Marienburg, was the last of the twelve he completed, and along with Der Bärenhäuter (1898) and Der Kobold (1903), one of his finest. Siegfried had an amazing gift for melody that was further refined and developed under his teacher Engelbert Humperdinck (1854-1921), who had studied with his father. It certainly shows here, making this a must for all fans of German romantic opera. Siegfried, like his father, wrote his own libretti, and the setting for this one is the town of Marienburg back in the Middle Ages. Known today as Malborg, or Malbork, it's located in an area of Poland that was then called Prussia. There are seventeen singing roles, and the story is quite complex. Suffice it to say that it involves the social and political situation in Marienburg under the Teutonic Order of Knights shortly after their defeat in 1410 by the Poles. This was at the battle of Grunwald, or Tannenberg as it's now called. You'll find a detailed synopsis in the album booklet, and the complete libretto is available on-line. Incidentally, possible associations between the opera and the composer's family life as well as the situation in Germany when he wrote it, abound (see the extensive notes). In most past performances of this three act opera, the overture was cut. But fortunately that's not the case here because it's arguably one of Siegfried's most outstanding, if not his best. It opens with a heroically flowing theme that may bring to mind the Rhein and Valhalla leitmotifs in Daddy's Ring thing. The mood then becomes apprehensive, but slowly brightens as the overture ends triumphantly. The first act begins with a thrilling tavern scene fraught with drama and intrigue, laying the foundation for what's to come. The ensemble numbers that follow are equally engaging, and the act ends with a lovely "Kyrie eleison" as the mother of Muthart, who's the blacksmith of the title, urges him to go to church with her. The next act is an operatic jewel! The skill with which the composer spins out and interweaves the vocal lines certainly makes him the equal of his illustrious father. It's a melodic treasure-trove where there's never a monotonous moment. The final scene is magnificent and builds to an exciting concerted climax that must rank with the finest in romantic German opera. Meistersinger move over! With a second act that good, one can only wonder how the composer can top it. But, he does with a finale in which the sheer beauty of the melodic line and dramatic intensity keep the listener on the edge of his chair! There are reminders of Wotan in the form of a character known as "The Lame Wanderer," except here he's the devil instead of a god. There's a very amusing scene where he creates a human form out of clay, but can't bring it to life. The accompanying music is demonically colorful, and the thought may cross your mind that the composer might have had the concept of a golem in the back of his mind. The opera ends with some of the most stirring music Siegfried ever wrote as the smithy goes up in flames, the knights defeat a band of enemy infiltrators, and the Grand Master of Marienburg apotheosizes Muthart, who’s been slain in the conflict. The soloists here are members of the PPP Music Theater Ensemble of Munich, and what they lack in bravura they make up for in enthusiastic, totally committed performances. The same can be said for the Baltic Philharmonic Orchestra of Gdansk under conductor Frank Strobel. This is a live recording, and consequently there are isolated instances of stage as well as audience noise; however, there's no applause until the very end. With a little known opera like this, we're very lucky to have a modern day stereo recording of it, and most will find the music so engaging they'll soon forget about any sonic distractions. Hermann Friedrich Wolf was born in Italy of a German father and Italian mother, and in his early twenties changed his name to Ermanno Wolf-Ferrari (1876-1948). This may well have been to distinguish himself from Austrian composer Hugo Wolf (1860-1903). Originally wanting to become an artist like his father, he first studied in Venice and then Munich. It was in Germany that he became interested in music and enrolled in the Munich Conservatory, completing his matriculation by age nineteen. For the most part an opera composer, he divided his time between Germany, Switzerland and Austria, before returning to Italy where he died. Having lived in all these countries, it's not surprising to find his music refreshingly Pan-European. While he adored Richard Wagner and Puccini, there's a lightness of touch in his scores that's more in keeping with Pergolesi, Cimarosa (see the newsletters of 30 August 2007 and 30 January 2008), Mozart and Rossini. On that note, hearing the delightful orchestral selections on this new release from Chandos, one might be tempted to call him the first neo-classicist. The program begins with an old favorite, his suite from the opera I gioelli della Madonna (The Jewels of the Madonna, 1911). Set in Naples and involving another blacksmith (see the Siegfried Wagner recommendation above) the opera is a verismo spectacular. The suite begins with the colorful "Festa popolare" followed by a beautiful intermezzo, which gives Mascagni (1863-1945) a run for his money. A melodious serenade is next, and the suite ends with the frenzied "Danza napolitana," which has understandably become a pops staple. Next, something a little more obscure but equally enchanting, the prelude and intermezzo from the opera I quattro rusteghi (The Four Curmudgeons, 1911). The opera is based on a comedy by Carlo Goldoni (1707-1793), and see if you don't think these two selections anticipate the neo-classicism of Casella (1883-1947), Poulenc (1899-1963) and Stravinsky (1882-1971). And now a real curiosity that many will be hearing for the first time, the Suite-Concertino for bassoon and orchestra (1932). In four movements, the bassoon is treated seriously throughout, particularly in the opening "Notturno" where it's given a most attractive solo melody. The next two songlike sections are alternately chortling and lyrical. The finale features a bustling baroque-styled beginning and ending, surrounding an expressive midsection. If you like this, by all means try some of Ermano's other concertante works, featuring the cello, English horn, oboe and violin. The concert continues with the tiny gem of an overture and brief intermezzo from his very popular opera Il segreto di Susanna (The Secret of Susanna, 1909). The contrapuntal ease with which he juggles the four infectious tunes introduced at the beginning of the overture is extraordinary! By the way, for the benefit of those not familiar with the opera, Susanna's secret is she smokes! Another overture and intermezzo are next from L'amore medico (Doctor Cupid, 1913) based on Molière's (1622-1623) play L'Amour médecin, which originally had music by Jean-Baptiste Lully. With alternating slow and fast sections, the overture is more dramatic than what we've heard so far, and ends peacefully but with a cheeky final outburst from the full orchestra. The composer's gift for melody is evident in the intermezzo, which features attractive passages for solo cello. The opera Il campiello (The Little Square, 1936) is based on another Goldoni comedy, and we're lucky to have two orchestral selections from this rarity included here. The intermezzo is a gorgeous melodic outpouring spiced with Rossinian tics that preclude its becoming too cloying. As the excellent album notes point out, the delicately charming ritornello is quintessential Wolf-Ferrari. For many of us the final selection, his overture to the opera La dama boba (The Stupid Lady, 1939), which is based on a play by Lope de Vega (1562-1635), is the highpoint of this disc. With a setting of Madrid, there's something appropriately Spanish about the reserved introductory melody. But the pace soon quickens with a catchy, almost birdlike-pecking motif that introduces a slower more pensive section. The opening theme is then restated and achieves big tune status as the overture ends glowingly, bringing this stunning disc to an all smiles conclusion. Italian conductor Gianandrea Noseda is no stranger to these pages (see the newsletters of 16 January 2006, 1 March 2007 and 15 January 2008), and obviously has this music in his blood. He elicits performances from the BBC Philharmonic that leave what little recorded competition there is in the dust. A big round of applause must also go to bassoonist Karen Geoghegan for her striking rendition of the Suite-Concertino. The first horns had no valves, and the pitch was changed by moving the hand in the bell. This was referred to as "hand-stopping" (see the informative album notes), and these instruments, known as natural horns, were very temperamental and difficult to play. Around 1818, pitch reliability improved somewhat with the invention of the valve horn, but the instrument still remains one of the most unpredictable in the orchestra, as any frequent concertgoer can tell you. That's all the more reason to sing the praises of this new hybrid, CD(2)/SACD(2/5.1) release from Melba. It features a superb collection of lesser known works for horn and orchestra stunningly performed by one of today's finest hornists, Australian-born Ben Jacks. Not only that, but there are three world première recordings here! The concert begins with the first recording of a 1995 horn concerto* by French composer Jean-Michel Damase (b. 1928). In four movements, there's something of "Les Six" in the opening, melodic moderato. The perky scherzo is a delightful example of Gallic impishness, while the following andante has a main theme somewhat reminiscent of that in the last movement of Randall Thompson's (1899-1984) second symphony (1931). The animated finale, an allegro, gives Jacks a chance to show off his considerable abilities on one of the world's most fickle instruments. French composer Charles Koechlin (1867-1950) is represented next by his Poem for Horn and Orchestra*. This is an orchestral version he made in 1927 of his sonata for horn and piano (1918-1925). The first of its three movements could well be a musical depiction of a verdant mountain valley. The sudden appearance of what sounds like a hunting party conjures up images of Weber's (1786-1826) Wolf's Glen. The following andante with its extended melodies and honeyed horn lines might well describe a beautiful sunset. One can imagine the finale as inspired by those pelagic poems of Walt Whitman (1819-1892) that motivated Delius to write Songs of Farewell (1929-30) and Vaughan Williams, A Sea Symphony (No. 1, 1903-09). Another first recording of an additional work by Damase follows. His Rhapsody for Horn and Orchestra** (1986) was written for and premièred by Barry Tuckwell, who lays down his horn and takes up the baton here. According to the album notes, it was to be inspired by the sea, and begins with dotted motifs followed by an extended ascending melody for the horn which could be an ocean sunrise. The tempo gradually increases, suggesting gentle sea breezes and circling gulls as we set sail for distant shores. The work ends peacefully with the soloist and orchestra painting a picture of graceful rolling waves. The variety of tonal colorations Jacks produces on his instrument during the course of this fifteen minute voyage is amazing. In 1906 French composer Paul Dukas (1865-1935) was asked to write a piece for the Paris Conservatory annual horn competition being held that year. He came up with his Villanelle*, or Rustic Song, for horn and piano, which, like Koechlin, he later orchestrated. Unfortunately, being one of the most self-critical composers who ever lived, he subsequently destroyed the expanded version! But take heart, because the first recording of a new realization of it by New Zealand arranger Paul Terracini is included here. Based on an attractive lyrical melody in tandem with another bubbly, jolly tune, it's a thrilling tour de force where every aspect of horn playing technique, including "hand-stopping," is explored. Written ten years before the Dukas, Camille Saint-Saëns' Concert Piece for Horn and Orchestra* (1887) is definitely not for amateurs, and contains passages that would be impossible on a natural horn (see the opening paragraph). It opens with the soloist stating a heroically angular theme that's repeated with virtuosic embellishments. An attractively lyrical developmental section follows, and then the piece ends in an exciting tongue-tying coda. It's Camille at his best and totally devoid of any academia! British-born and educated George W. L. Marshall-Hall (1862-1915) spent the last half of his life in Australia, and was best known as a teacher, poet and conductor. But this first recording of his Phantasy for Horn and Orchestra** (1905) proves he was also an accomplished composer. It's a beautiful late romantic reverie that sounds for the most part English except of an occasional Germanic turn of phrase. Many will find it was worth getting the disc for this alone! By the way, you may also want to investigate his symphonies. Under the watchful eye of conductor Tuckwell, whose reputation as a hornist is legendary, our soloist Ben Jacks performs everything to perfection. That along with the exceptional support rendered by The Queensland Orchestra (*) and Orchestra Victoria (**) make a strong case for this music and a horn recital you'll not soon forget! Down through the years the Australian audio engineers have produced some of the world's finest recordings, and this hybrid disc is no exception. Even though the venues for each of the orchestras were different, the soundstages for both seem identical, and very convincing in both the stereo and multichannel modes. The horn is beautifully captured and perfectly balanced against a totally natural sounding orchestra, where the tiniest of instrumental detail is faithfully reproduced. In the stereo mode, most will probably find the string sound superior in Super Audio. The multi-channel track very successfully recreates the best virtual seat in the house. Audiophiles will want this one.